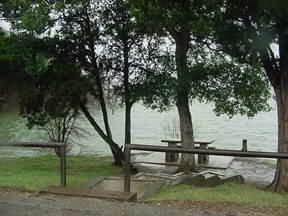 Lake Waco is located in central Texas and is located entirely within the city limits of Waco, Texas. 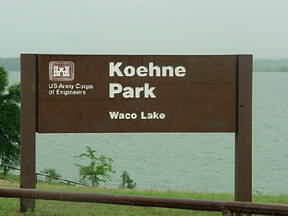 Lake Waco is a U.S. Army Corps of Engineers operated lake in McLennan County. Lake Waco is about half way between Dallas/Ft Worth and Austin, Texas. It is about an hour and half drive either way and is well worth the trip. 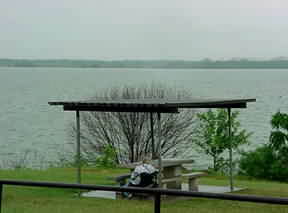 Lake Waco has several nice parks around the lake. 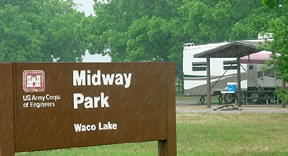 Lake Waco offers various types of recreation such as boating, jetskiing, water skiing, camping, fishing, swimming, and has birding areas, and biking and walking trails. Lake Waco is on the Bosque River just off Texas Highway 6. 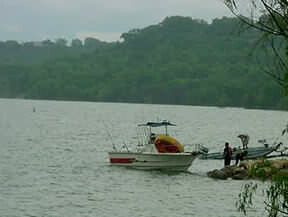 The lake has seven boat ramps, excellent campsites with water, electricity, and dump stations available around the lake. 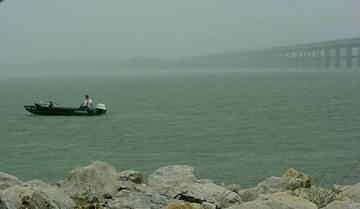 Lake Waco has a surface area of 7,270 acres and a maximum depth of 85 feet. The water levels don't usually fluctuate more than 2 to 6 feet. 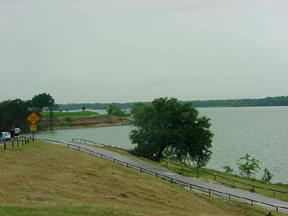 Lake Waco is fed by the North Bosque and Bosque Rivers and several smaller creeks in the area. Crappie fishing is hard to beat at Lake Waco. White crappie predominate, but black crappie are caught occasionally. Largemouth bass, White Bass, Catfish, and Sunfish are also good, especially in the spring. Texas Parks and Wildlife rates fishing at Lake Waco as excellent for Catfish; and good for Largemouth Bass, Crappie, White Bass and Sunfish. Want some great food in the Lake Waco area? They serve the finest steaks and seafood in the area. Right next to IH 35 and only minutes away from Baylor and Lake Waco. 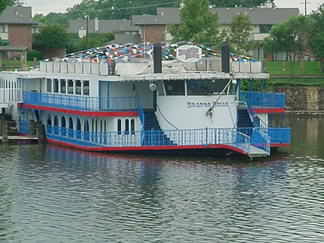 .Looking for lodging in the Lake Waco area? This house is decorated with antiques and Texas Hill Country Art. Guests will enjoy the full breakfast that is served every morning, and tea and snacks in the afternoon when they get the munchies. Close to all the Waco area attractions. 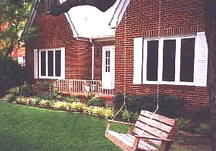 The Lighthouse Bed & Breakfast, offering one of the best bed and breakfast experiences in Texas, is located in the Waco area near the ranch of President George W. Bush. You will find many rare animals at this fine facility. Dr Pepper was invented by a Wacoan and the museum is housed in the original bottling plant. Chartered in 1845 by the Republic of Texas and affiliated with the Baptist General Convention of Texas. 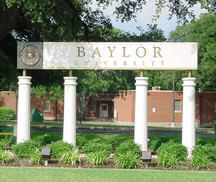 Baylor is the oldest institution of higher learning in the state and the largest Baptist university in the world. 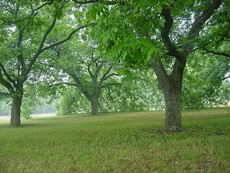 The current Western Whitehouse is located on 1580 acres at nearby Crawford west of Waco. The first official state park in Texas. Many artifacts pertaining to the Improved Order of Red Men, Degree of Pocahontas, Texas history, American history, and world history are also on display. The Lake Air Scuba Center offers Waco and Central Texas the finest in Scuba Diving Instruction and Training. Extensive collection of Texas Ranger and Old West artifacts. This library was dedicated to the great British Victorian poets, Robert and Elizabeth Barrett Browning. Located on two and half acres of the McLennan Community College. See Texas sports history come alive with the Tom Landry Theater and interactive displays! Oldest, continuously operated, natural history and cultural museum in Texas. Free admission. Enjoy free summer concerts in the park. Stroll the River Walk all year long! The River Walk starts at Ft. Fisher Park and goes over the Waco Suspension Bridge all the way to the Herring Avenue Bridge where the river walk ends. Built in 1870 and a model for the Brooklyn Bridge, this famous Waco landmark provided cattle and cowboys following the Chisholm Trail the only span across the Brazos River. 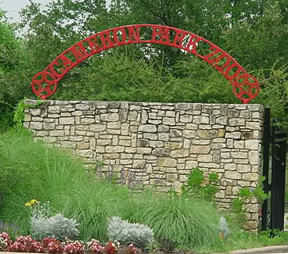 A complete water park experience located in Waco Riverbend Park. It has two pools, a 22-ft. slide, water playscapes, and more. 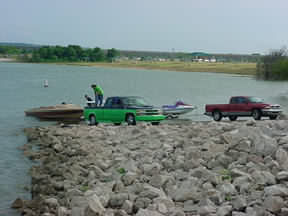 Lake Waco has 7 boat ramps so you will find plenty of places to launch your boat. 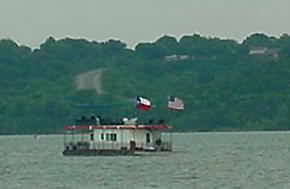 Our viewers are looking for vacation rentals on Lake Waco. for Lake Waco, please . Search the entire Central Texas MLS and the San Antonio MLS without registering.